Responsive web design is nothing else but a particular approach to creating a website. A responsive website will change the size of its elements when you resize your browser window or view the website on a different device such as your tablet, phone or even on a different computer with another screen size. Responsive website design works its way to allow you to view content in a website from any of your devices, any screen sizes with full content in one page. It's exactly the same as when you surf websites on your computer. You will be saved from getting some headache for scrolling to the left, right, top, down or zooming in and out as well as going over the entire screen just to read something out. A responsive website design is always flexible to adapt itself to fit with any sizes of screens without having your shopper to feel tired. Its advantage lies in the fact that it allows to make a website that can be viewed on a multitude of screen resolutions. Responsive websites help the users to utilize and surf the website without having trouble regarding the screen and pixel size. The backbone of any website is its design. If it is designed efficiently by correct means it will work wonderfully for an individual. Responsive website designing is a new way of doing online business. The increase in mobile traffic and new technologies is the main reason of this change. No matter which industry you belong too, your online business greatly depends on millions of smartphone users worldwide. 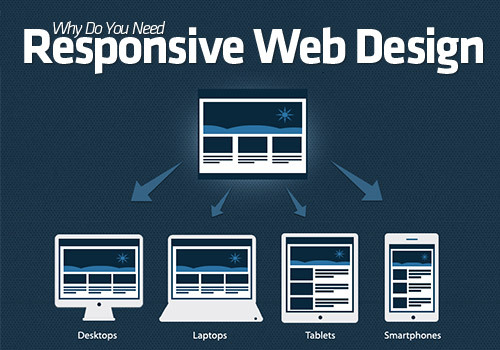 Responsive website design is the latest trend and a must have today. A large number of adults today are using their mobile phones to go online. If you have a responsive website, you have a better chance of catching these users. A responsive website designing project is the need of the hour. It usually does not cost that much but it certainly worth every penny that you have paid. After all increasing business and satisfying more clients is what you need. So invest in a mobile friendly website to reap the benefits of above mentioned demographics. Website Must Be a Responsive Website . Why ?